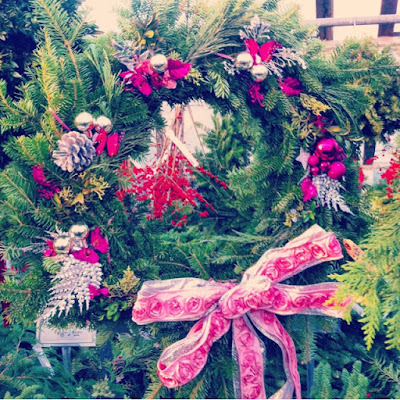 Handmade Wreath I Made for Allandale Farm, Inspired by Tori Amos's Holiday Album Song, "Pink and Glitter"
Yuletide Greetings, Happy Hanukkah, Merry Christmas, etc etc - in other words: Happy Holidays All! 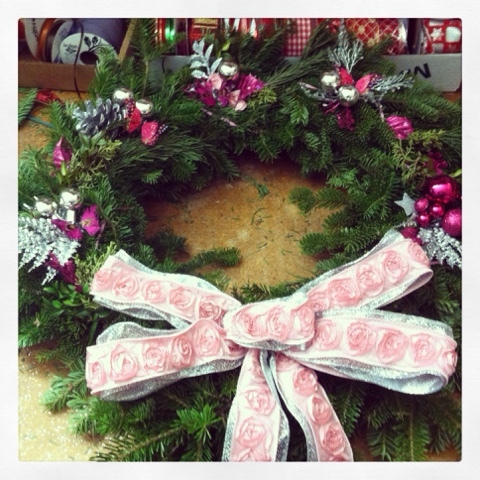 This handmade wreath was inspired by a song, "Pink and Glitter" by Tori Amos, my favorite singer and Best Friend I Used to Say I Never Met but Now I Say I Met Once for Two Minutes. I wore that bright pink dress on purpose, because I knew she'd like it, given this song and an album with the color pink in the title. And she even said, "Well, you look very nice." Which is like "OMG OMG OMG" but all I said was, "Oh, I'm so glad you think so!" Side note: Jane Austen is my Dead Best Friend I Never Met. Sadly, there's nothing I can do to meet her, except maybe find that henge from Outlaner or something, but then I'd lose electricity, smoothies, and feminism. Not really worth the trade off. Sorry, Jane! The lyrics for "Pink and Glitter" include the line "Shower the world in Pink and Glitter." So with this wreath I handmade at Allandale Farm when I worked there in 2012, that's exactly what I did! This either went to the home of a really adorable sassy 3rd grade girl, spunky lady, or fabulous guy. Bless! Hahaha! This song is on the Solstice Album "Midwinter Graces."